De Veja Wata is the vegan sneaker of this season. Fairtrade made from sustainable organic cotton and wild rubber from the Amezone, in combination with the jute mesh layer. Veja Wata is the vegan sneaker of this season. Fairtrade made from sustainable organic cotton and wild rubber from the Amezone. Perfect for the summer! Veja V-10 Extra White Nautico Pekin is the besteller from the Veja family. The outside of these sustainable sneakers are made of leather, the inside of organic cotton and the soles are from wilde rubber. This season you will find a number of sustainable shoes of the popular Veja brand at Take it slow. These sustainable made sneakers with a modern design are easy to order online in our online store. 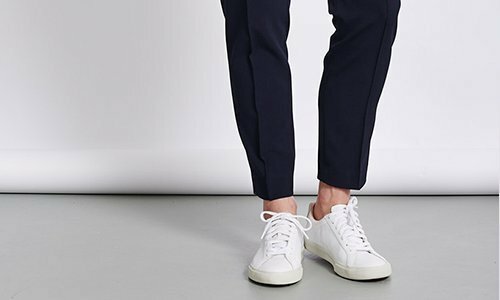 Due to the minimalist color combinations, these white sneakers are suitable for any occasion. The shoes are handmade and of excellent quality. Moreover, they are produced in an environmentally friendly way. You will also find Nulla Nomen sandals in our online shop. In addition to the beautiful design, the durable Veja sneakers and Nulla Nomen sandals are perfect. At Take it slow, style, comfort and sustainability are central.